Reality Check: Would Brexit mean border controls for NI? 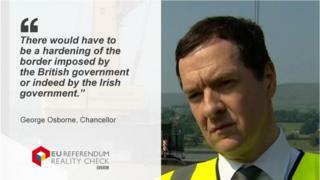 The claim: Chancellor George Osborne says there would have to be a hardening of the border between the UK and the Republic of Ireland if the UK votes to leave the EU. Reality Check verdict: It's hard to predict what would happen to the border between the two countries at this stage. It would depend on the type of agreements the UK negotiates. Northern Ireland is the only part of the UK to share a land border with another EU member state. It's more than three hundred miles long, and stretches from Carlingford Lough on the Irish Sea to Lough Foyle in the north-west. Throughout the EU referendum campaign, both the Remain and Leave sides have made frequent claims about what might happen to the border in the event of a UK exit from the EU. Secretary of State for Northern Ireland, Theresa Villiers, has argued that the existing situation would remain the same even if the UK votes to leave. Similarly, Boris Johnson told the BBC that Brexit would leave arrangements on the Irish border "absolutely unchanged". He said: "There's been a free travel area between the United Kingdom and the Republic of Ireland for, I think, getting on for 100 years." The UK and Ireland entered into a Common Travel Area (CTA) agreement in 1923. This is an informal travel arrangement which means that no passport controls are in operation for Irish and UK citizens travelling between the two countries. The UK and Ireland also co-operate on immigration issues and the arrangement is mentioned in Protocol 20 of the Treaty on the Functioning of the European Union. However, during the Troubles there were frequent road closures and check points at the border. When the Common Travel Area started in the 1920s, the EU didn't exist and when the UK and Ireland did join the EU, it was on the same day. The Irish border has never separated an EU member from an EU non-member - so this would be an unprecedented situation. A lot would come down to how things are worked out between the two countries in the event of a leave vote. But other EU countries may have to agree to them forming a bilateral agreement. "Under EU law, any future relation between the Republic of Ireland and the UK would be subject to agreement not only with the Republic of Ireland, but with the whole of the EU". A Brexit would certainly impact on the way the two countries deal with immigration and trade, and new arrangements would have to be put in place. If there are drastically different immigration policies between Ireland and Northern Ireland, border controls would have to be re-introduced. As it stands now, the Republic of Ireland is not in the Schengen zone, meaning, should the UK maintain a CTA, there's no danger of people crossing from mainland Europe into Ireland and then through to the UK without showing their passports. As far as trade is concerned, if the UK left the EU, it may not necessarily remain within the European Economic Area (EEA). If it left, it is likely that customs controls might have to be introduced, as the UK would no longer be part of the single market. Even if it did remain with the EEA, spot checks on goods could be brought in, as is the case at the border between Norway and Sweden. EU referendum: What would a Brexit mean for NI economy? What would a British exit from the EU mean for Ireland?